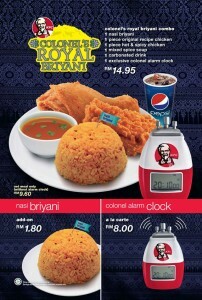 Just had KFC’s Colonel Royal Briyani 2 days ago. We had it at SS2 KFC. I am impressed with the advertisement that I had seen on TV a few weeks ago, so I make a note to try it one day. And the opportunity came by and we ordered a KFC’s Colonel Royal Briyani. When my girlfriend brought me the set, I was already a bit disappointed because of the smell of the nasi briyani. It doesn’t even smelled like one. It was smell and looked like white rice, only with some coloring. The soup was even worse. Not even near the Indian version standard. Totally disappointed. 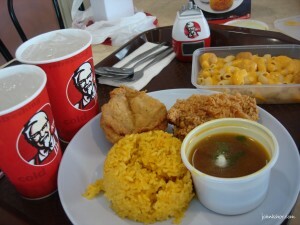 I understand that KFC is trying to innovate their menu to excite us with new flavours but please do it whole-heartedly. It makes me feel that they are innovating for the sake of innovating. Please do us some favours and give us a real change. 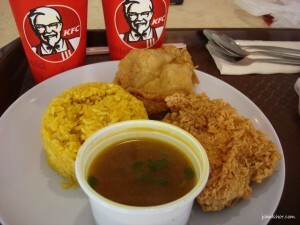 P/S: I still liked the Indian spice KFC, I can’t really remembered the name already. The hot & spicy one. Next story Finally THEY are here!